All Joe Lewis systems are not the same. For Joe Lewis devotes there are several “eras” that represent the totality of the Joe Lewis life learning series. Joe practiced and taught Okinawan karate between 1964 and 1967. Then he met Bruce Lee. The Bruce Lee Era can be identified roughly as 1968-1971. During this time Joe served as a ‘personal-trainer’ providing private lessons in how to fight in both the street and the ring. When the original Joe Lewis-Style™ kickboxing era came to an end in 1971 Joe elected to adapt more of a competition strategy. The full contact karate era can be used to best describe Joe’s interest between 1973 and 1975. He won the World Heavyweight Full-Contact Karate/Kickboxing title in 1974. Between the years 1976 and 1982 Joe Lewis was enjoying a career change as actor and movie star and was less active in martial arts circles. From 1983-1999 we typically identify as the “AIKIA” era in which Joe (with partner Dr. Jerry Beasley sought to build his brand working with independent martial arts schools worldwide. The Joe Lewis American Karate Systems became the primary vehicle for instruction. Karate was at the time the generic term used to identify striking arts of Asian descent. Joe Lewis “karate” referred to the full-contact kickboxing style and not to classical karate routines. By the year 2000 the term “Karate” had become identified by the public mostly with “Karate Kid” movies. Not something a ring-tough and street-smart Joe Lewis would support. The Karate College program designed in 1988 by Dr. Beasley, and world champions Joe Lewis, Jeff Smith and Bill Wallace had promoted a mixing of martial arts as early as 1990. As the MMA format became popular with the public Joe sought to align his name with the mixed competition format and in 2000 developed a new direction for competition and sport fighting he called the Joe Lewis Fighting Systems. JLFS had moved far away from the personal defense concept of the original Joe Lewis-Style™ toward a dedicated focus on competitions. During the era of the JLFS Dr. Beasley served only as personal promotional advisor to his friend and with Joe’s blessing remained true to the original intent of the (1968-1971) Joe Lewis-Style™. 5- I have studied jeet kune do. Is this the same as the Joe Lewis-Style™? Answer. No. JL-S™ is not JKD and JKD cannot be considered JL-S™. Modern day JKD seems to identify closely with either the classical Chinese or Filipino arts. Bruce Lee had sought to “free his comrades” from the limitations of classical martial arts. Although Joe was originally required to learn various wing chun drills from Bruce, Joe Lewis made it clear that he did not believe in the wing chun postures and theory. Bruce was at the time distancing himself from the need for a classical art like wing chun. The classical wing chun postures, drills and theories used in the modern take on the “Original” JKD are not included in the Joe Lewis-Style and JL-S™ should not be considered to be simply jeet kune do. Rather JL-S™ combines Bruce Lee’s Fighting Method aka scientific street fighting with the advanced ring science of boxing and includes functional kicks with the various grappling methods Joe and Bruce had been independently learning from judo-jiujitsu and from Wally Jay and Gene LeBelle. Bruce Lee’s essential principles of fencing’s 5 ways of attack were reformulated by Joe Lewis as the angular attack methodology and became the cornerstone of the Joe Lewis-Style™. Both right lead and orthodox stances are used. One could conclude that without Bruce Lee there would not be a Joe Lewis-Style™. For proponents of JKD the Joe Lewis-Style™ exemplifies the evolution of Bruce Lee’s “all-out sparring” method incorporating the essential and advanced JKD theory and practice. It’s not the techniques that you collect but the skills you can use that separates JL-S™ from modern JKD. For followers of the Joe Lewis-Style™ the way of the intercepting fist is a lot more than just the preemptive strike. Also consider the fact that the term “Jun Fan Kickboxing” was used to describe the original full-contact fighting and training method created by Bruce Lee only after he had passed. Between 1967 and his death in 1973 Bruce Lee taught and practiced only jeet kune do. Bruce Lee taught jeet kune do, no more, no less. Joe was trained in the full-contact “all-out” sparring method, principles and strategies, that Bruce called jeet kune do. Hence, Joe Lewis was taught jeet kune do, no more, no less. Bruce Lee had asked his star pupil, the world champion Joe Lewis to use the name “jeet kune do” but Joe elected instead to promote his own name by identifying his personal practice of jeet kune do as the Joe Lewis-Style™ self-defense. Joe intended to promote the intercepting fist, all-out sparring “street-fighting in the ring” Joe Lewis-Style™ in January, 1970 but instead of using the term Joe Lewis-Style™ the commentator used the term kickboxing. Joe intended to offer a sport where two combatants could conduct a street-fight in the ring sans legal consequences of street-fighting. Hence Joe Lewis-Style™ has been mislabeled as just kickboxing. It’s a whole lot more! 5- How can I learn the Joe Lewis-Style™? To begin, study and practice the videos made available free by Dr. Beasley. This information is as close as possible to the exact material taught from Bruce Lee to Joe Lewis, from Joe Lewis to Dr. Beasley and from Dr. Beasley to you. You can schedule a weekend training and certification program at the Beasley Martial Arts studio in Christiansburg, VA for a nominal fee. Contact CEO@Aikia.net for scheduling and pricing. If you ever had the privilege to study with or earn rank from our late Joe Lewis please consider joining our efforts to keep the original Bruce lee Era Joe Lewis-Style™ self-defense systems alive. 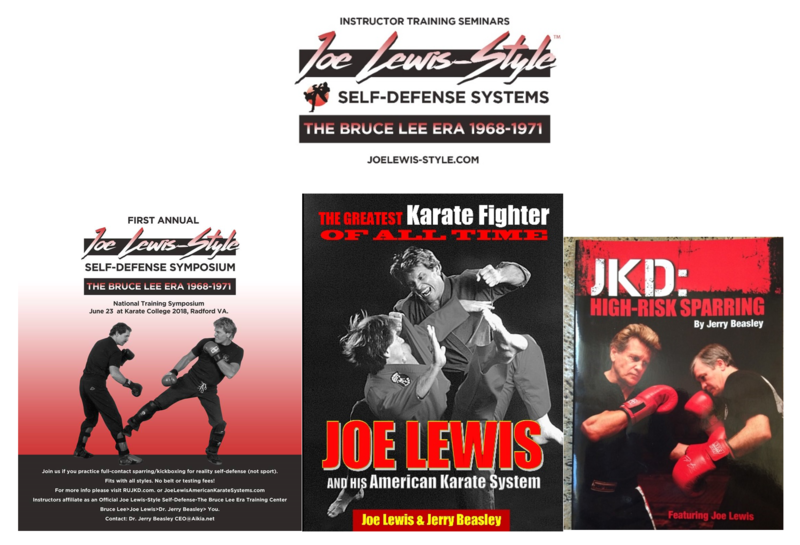 If you are new to the Joe Lewis-Style™ you too can trace your roots to the beginning of the full-contact self-defense systems originally envisioned by research partners Bruce Lee and Joe Lewis (1968-1971).